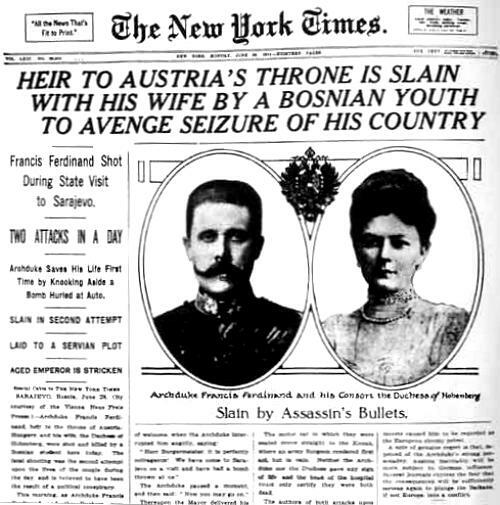 On June 28, 1914, Gavrilo Princip gunned down Archduke Franz Ferdinand and his wife, Sophie, as they rode through the streets of Sarajevo. Journalists and pundits have relied on a few select metaphors to describe the consequences of the assassination. It “triggered” the First World War. It was the “spark” that “ignited” or “set off” the “kindling” or “powder keg” of latent European antagonisms. Adesnik goes on to give a good summary of the decisions leading from the assassinations in June, 1914, to the outbreak of war that August.